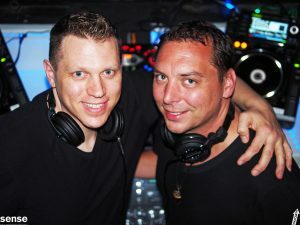 Meeting through mutual friends, Ben Seagren and Dean Samaras formed SENSE SF in 2001 to take full control of their event production. They have performed, produced shows and held residencies at various SF venues over the years – Audio, Hawthorn, Public Works, Supperclub, Vessel, to name a few. However, they truly made a name for themselves from their long standing residencies at two of San Francisco’s most iconic venues: Ruby Skye (2003-2011) and the Endup (2004-2015). Collaborating on music together now for over 15 years, Ben and Dean pride themselves on the ability to play creatively play a wide range of music seamlessly. The Show – After producing successful 6AM morning events (The Early Show) and after hours events (The Late Show) at the Endup – SENSE SF combined the concept’s and launched at 14 hour marathon event, THE SHOW, in 2006. Running 9 years, we were fortunate to curate a tech-house/techno sound by bringing the artists we admired and respected – Victor Calderone, Joseph Capriati, Nicole Moudaber, Pig & Dan, Carlo Lio, Luca Bacchetti, and many more.